Many years ago I purchased the diary of Second Lieutenant (Temporary) Reginald Nixon Wood, 9th Battalion Royal Irish Fusiliers (9/RIF), who died on Tuesday, 22 February 1916. On the 100th anniversary his death, and of the Battle of the Somme, this post, aims to tell the story of his tragically short war, a few months before the ‘Big Push’. The 9/RIF, 108th Brigade (36th Division), with a strength of 30 officers and 995 rank and file, disembarked at Havre on 4 October 1915. It then proceeded to Rainville where it settled into billets and a period of training. This included gas demonstrations, rifle and bombing drill and Brigade field exercises. On 17 October the 9/RIF left Rainville, arriving at Hebuturne on 19 October for instruction in trench warfare, attached to 144th Brigade (48th Division). The general method for instruction at this time was the attachment of formations and units to those next larger, that is a battalion to a brigade, a company to a battalion. Each company of the 9/RIF was attached to one of the battalions of 144th Brigade for individual instruction. On 23 October, the 9/RIF received its first casualty, Private Wilson of C Company, who was wounded in the arm. ‘During their period of attachment both Officers and men displayed the greatest keenness and anxiety to profit from the instruction given, and when holding sections of the trench line, as companies, they carried out their duties efficiently, and kept the trenches clean. The following day he left Beresford House, Ireland, for England. He then left London for France on 28 January. On 29 January, he was attached to A Company and Private Elliot was made his servant. He joined up with the Battalion on 31 January at Prouville. On 1 February, 1916, the 36th Division was transferred to XVII Corps and received orders to move to the trench line. The whole Division marched towards the front line between 2 and 6 February. The Division took over the front line from 4th Division at noon on 7 February; the Divisional front extended between the Ancre and Mailly-Mallet to the Serre Road with the 108th Brigade on the right, the 107th on the left, and the 109th in reserve. Divisional Headquarters were at Acheux. The 9/RIF War Diary states this was a nine and a half mile march and also confirmed the good billets. The 9/RIF War Diary states that it was a 10 mile march from Halloy - Pernoise to Puchevilliers. 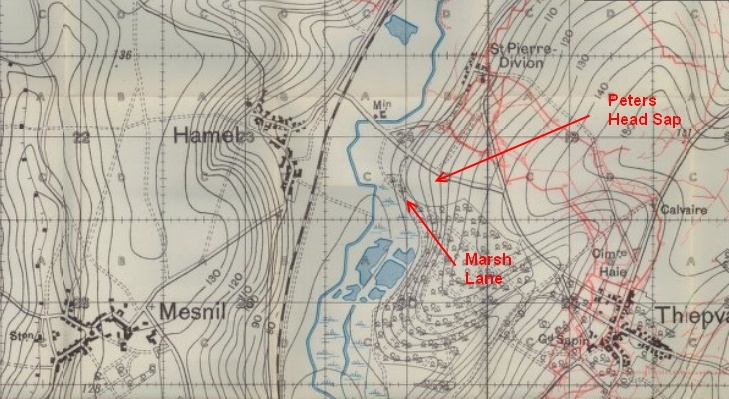 The Commanding Officer and a small party went onto Martinstart and then to the trench line at Hamel to make arrangements for going into the line. They returned to Puchevilliers that evening. 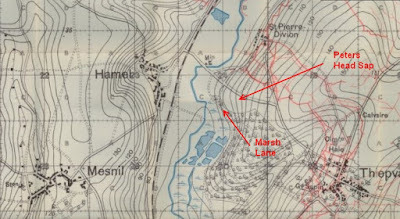 This was a march of nine miles according to the 9/RIF War Diary. D Company marched up to Mesnil to relieve a Company of the 1st East Lancashire Regt (11th Brigade, 4th Division). In his diary, Wood also recounts these events, noting heavy shelling. He managed to find cellar accommodation for all his men, moving their beds down into the cellars; as a result he notes he ‘slept well’. He recorded the fatal casualties as ‘Cook “C” Company killed by a shell. Another man mortally wounded’. He also notes that ‘Johnny Walker appointed servant’, replacing Elliot. The 9/RIF War Diary records that shelling continued during the following two days. On 13 February, enemy artillery put 12 shells into the west of the village; Lieutenant Gibson had a narrow escape when six ‘whizz bangs’ fell around him but without causing him any harm. On 14 February, the enemy landed 47 shells in Mesnil, apparently searching for British artillery. The 9/RIF also supplied a working party in two shifts of 180 men each to dig a new trench in the second line defences. The 9/RIF War Diary notes 46 other rank and file also went on leave. Above: Jacobs Ladder ran behind Hamel Military Cemetery, running up the slope in these two images towards Mesnil. According to Linesman, I was actually standing on what was Jacobs Ladder when taking the second shot. The 9/RIF War Diary notes that the ‘past few week’s rain has left the trenches in a most deplorable condition.’ The War Diary also notes that the 12th Royal Irish Rifles lost one man who was smothered by a trench, opposite Lancashire Post, falling in and burying him. The 9/RIF relieved the 12th Royal Irish Rifles on the evening of 17 February, with “C” and “D” Companies taking over the front line, “B” Company in close support and “A” Company in reserve. The Company in reserve was responsible for the defence of the Ancre ‘and its swampy valley, filled with miniature lakes.’ The was carried out by a platoon manning small isolated posts, the most advanced being at the bridge on the Thiepval-Hamel Road. Wood notes that it was a ‘Glorious moonlit night, but very cold later.’ The troops on the right of the Battalion were 8th West Yorkshire Regt (32nd Division) and on the left the 11th Royal Irish Rifles.The 9/RIF War Diary notes another trench collapse as a result of the bad weather, the fire trench between Signal Box Post and Lancashire Post. He also notes that when being relieved by Second Lieutenant Montgomery, a sentry at Castor Post reported a man ‘crossing the river near the tree trunk’ although a patrol sent out the bridge did not find anything to report. Wood also records in his diary for 19 February a rumor that ‘Kentish Villas is mined.’ According to the 9/RIF War Diary, it was the Officer Commanding D Company that reported the signs of mining. An officer from 22nd Tunneling Company, billeted at Auchonvillers, visited the following day and after carrying out a careful study reported that, in his opinion, the sounds heard were not caused by enemy mining. Kentish Villas, or Kentish Caves, was a dugout in a small chalk cliff, just to the east of Hamel. Above: The site of Kentish Villas, or Caves, today. Dugouts were made in the embankment and where quite exposed as the entrances faced the Germans. The 9/RIF War Diary also notes heavy shelling of Auchonvillers, with smells of lachrymatory shells reaching the Battalion area. Aircraft and machine guns from both sides were also noted as being very active on 19 February. Second Lieutenant Wood is buried in Hamel Military Cemetery, Beaumont-Hamel, I.A.23. Third Image: Grave of 2nd Lieut. Wood. Forth image: Grave of Private S.J. Forde, killed on the same patrol as 2nd Lieut. Wood. The 9/RIF were relieved by the 12th Royal Irish Rifles on the evening of 23 February and moved back into reserve at Englebelmer. It underwent a period of refitting and cleaning of clothing as well as supplying working parties to keep roads clear of snow. The 9/RIF returned to the front line at Hamel on 28 February. The trenches were described as being in ‘deplorable condition’ due to the recent snow followed by a thaw. One Officer (Second Lieutenant Wood) and two Other Ranks killed; one Officer and nine Other Ranks wounded. Above: Hamel looking from the Thiepval ridge. Jacobs Ladder ran up the bare field in the background.